A £98,000 payout to a former council chief executive has been described as a "vast, rambling scandal" by councillors. Anna Klonowski resigned from Bristol City Council in 2017. An auditors' report later found half the payment was non-contractual and discretionary. 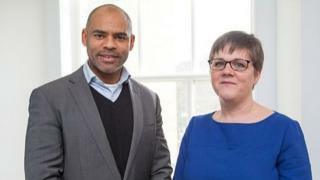 At a council meeting on Tuesday night, Bristol Mayor Marvin Rees faced calls to "think about" resigning. But he insisted the payment was made following legal advice. Ms Klonowski left her £160,000-a-year post after seven months in September 2017 to look after her parents. At a debate at City Hall, Conservative councillor Richard Eddy said "many" suspected the payout was "hush money". "It stinks to high heaven we're paying good money, instead of on frontline services, to senior officers who were not contractually eligible for that," he said. Green Party councillor Paula O'Rourke said there was a "truth vacuum" surrounding the reasons for the payoff. "If somebody resigns and breaches their contract, they're not entitled to any payout," she said. Liberal Democrat councillor Gary Hopkins said the "cover-ups and obfuscation" had been going on "far, far too long". "This vast, rambling scandal is surely the last nail in the coffin for the mayoral system," he said. But Mr Rees insisted there was no "grand conspiracy". "There were no procedures in place to oversee the departure of senior staff," he said. "In that context we sought legal advice and we followed that advice." The council agreed recommendations to change how severance pay is awarded, bringing in limits and ensuring relevant committees are informed over how and why any payments are made.